Crossfit training is sweeping the nation. Our turf is perfect for sled work, sprints, agility, stretching… You name it! Don’t let your facility miss out on the benefits of having turf in your gym. Padded turfs from Synthetic Turf of Illinois provide the right combination of cushion and traction for the athlete while delivering premium durability. Choose between a variety of different turfs that best fit your needs, including colored turf. Make your facility stand out by adding colored turf for yard-lines, hash-marks, numbers….even your gym’s logo and or favorite slogan! 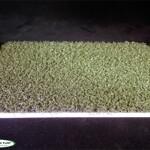 We have turf available in red, white, blue, black, yellow, gray and of course, green. With our state-of-the-art water jet machine, we can do anything you can imagine in colored turf, as long as we have artwork in a PDF format. Colored turf always looks good and never fades are gets “hard” like paint does. 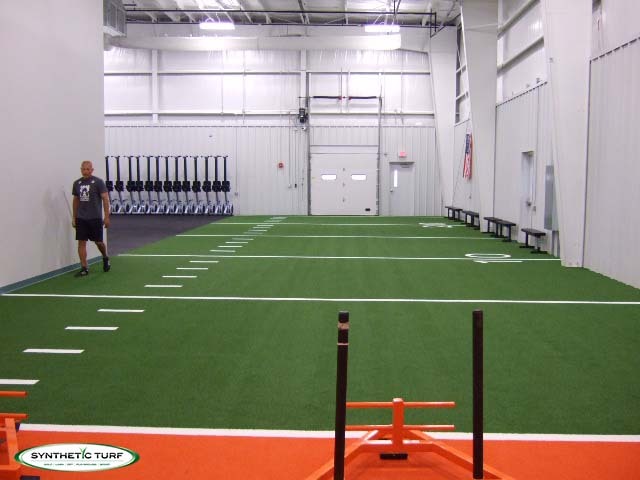 Carpet-style turf is the preferred turf for several indoor uses like cross-fit training, speed and agility drills, fitness centers, sports arenas and training areas. 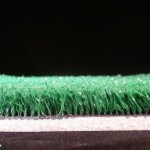 There is NO rubber or sand fill in this turf and it can be cleaned and sanitized easily. Non-infilled carpet-like turf is optimal for sports turf because it is designed with a shorter pile, which eliminates using any type of sand or rubber infill. Maintenance Free! No grooming of the area is necessary like with in-filled or field turf type turf. These turfs are made with safety in mind, features that keep athletes happy and healthy. The padding adds shock absorbency and takes the place of all that rubber in-fill. 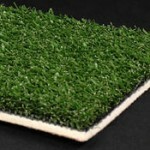 These turfs are available without foam pads as well. Perfect for sprints, cross-training and speed and agility training. A great alternative to rubber flooring – looks better, feels better, better on the athletes and more versatile than rubber flooring. Using a weighted sled is the harshest activity one can do on turf. Make sure your sled-turf is made of either nylon or polyethylene, not the less expensive polypropylene turf. The right adhesive along with the right installation method are also just as important as the right turf. We are your crossfit turf experts! We can provide complete turn-key installation or provide the materials and instructions for your own installation.